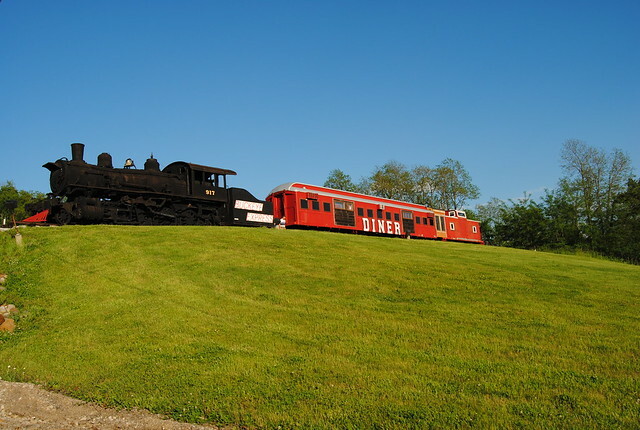 It was nice to eat inside of a train car. We weren't quite sure what to do when we entered the building. The lobby was full of people lined up at the cash register, and we didn't see anyone to seat us. One of the repeat customers pointed out to us that we needed to order from the huge menu on the wall and pay for our dinner before finding a seat. We waited quite a while and then were able to place our order with the affable gentleman behind the counter. He was joking that we shouldn't expect speedy service and that he had never seen the place so crowded. 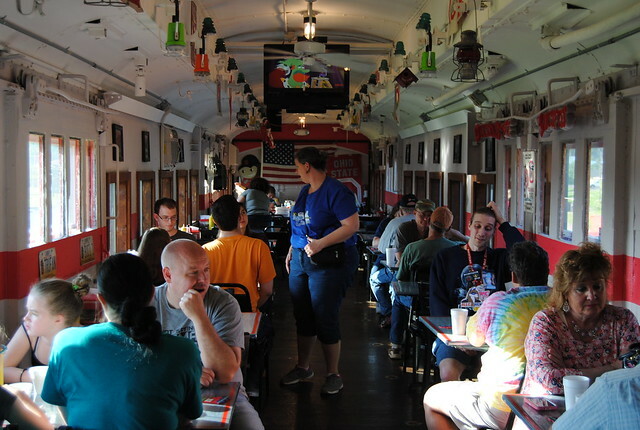 We found a couple of tables in the railroad car and waited for our food. We watched the beers outside the windows hovering to find their homes in the exterior wall of the restaurant. We experienced the not quite effective window air conditioning. We saw some kind of beaver or groundhog out in the lawn. 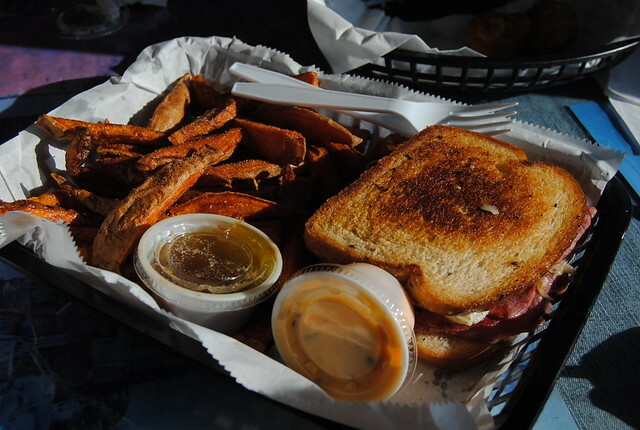 I ordered a Reuben sandwich and upgraded to sweet potato fries. I was disappointed that the fries were made to be sweet and not savory, being served with a side of cinnamon and brown sugar. The Reuben was well grilled, but the bread had been made overly greasy, perhaps by to much butter or something. The corned beef, Swiss and sauerkraut were fine, and the thousand island dressing was in a little cup to the side. Overall, the sandwich was average, at best. This place didn't offer water from their drink fountain, only providing bottled water. There interior of the train car was pretty basic. They had a couple of TVs mounted to the ceiling, but from where I was, I don't know what was playing. The eating space seemed a little bit cramped, and the entryway didn't seem especially efficient, although some of that was due to an abnormal amount of people. The food was good - nothing special, but certainly good enough. My ratings are based on how closely it met my expectations, rather than against some arbitrary standard. So I would say that my experience at the Buckeye was pretty much what I anticipated it would be. 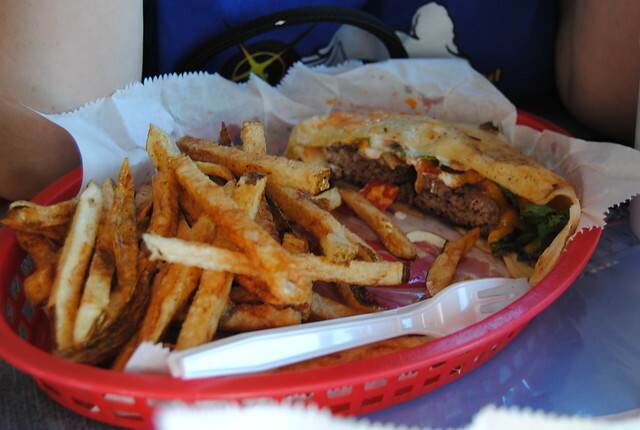 My quesadilla burger was AMAZING. The portions were plentiful. The fries would have been great with a teeny touch more salt. Waiting to place our order was a hassle, with too many people in the space and nowhere to shift for staff coming and going. But all the staff members we met were friendly and happy to help. Fun experience and I definitely would dine there again!